There are easily thousands of bikes on campus. Any point during the day there are hundreds of bikes locked up at different locations from Sproul and Dwinelle to Moffit and Barrows just to name a few. According to the UCPD there have already been 67 bikes stolen this semester alone and that’s only the number of stolen bikes that have been reported. Bike robbery is a real problem in urban settings like that of UC Berkeley. If you use a bike to get around there is already a risk that it will be stolen. However there a couple steps you can take to help protect your bike. Seriously, just do it. It only takes a moment, it’s free and it will ensure your bike comes right back to you if it is recovered by the police. Only 1,100 bikes have been registered this semester so if you haven’t registered your bike yet, now is the perfect time. You can register your bike any day of the week from 6 pm. from 9 p.m. at the UCPD front counter in the basement of Sproul Hall. You will need to bring your bike and your ID. 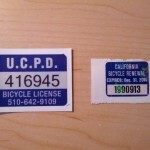 After that a friendly CSO will help you fill out the form to get your Bike License. You’ll put two stickers on your bike frame and that’s it, you’re done. Should anything happen to your bike and the police find it, you’ll have your bike home hassle free. The other way to protect your bike is to properly lock it. Locking just your front tire to a pole is a good way to only have a front tire when you return. Using a U-Lock is the best, cable locks are too easy to cut. A common rule a thumb is that a thief is going to go for the bike that looks easiest to steal so every extra step you take to secure your bike is ideal. 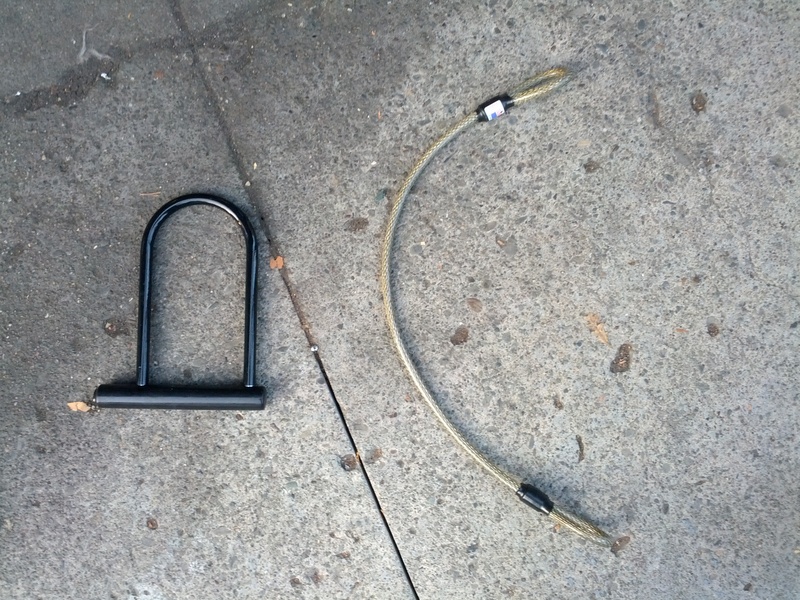 If you can, carry a second U-Lock or cable so you can secure both of your tires as well as your frame. 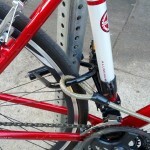 Use your lock to secure the back tire to the pole through triangle the back of the frame forms, (this will secure the tire as well as the frame). We’re securing the back tire with the U-Lock because it is worth more than the front tire. 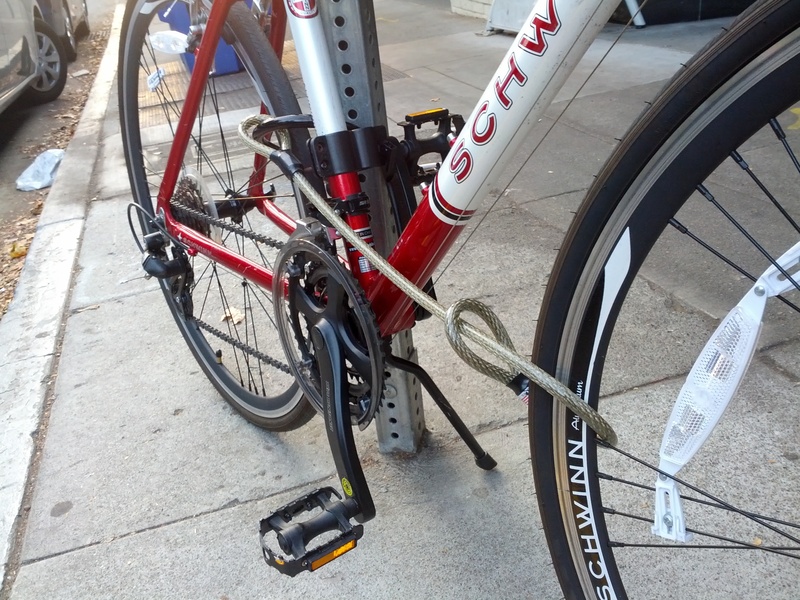 Then loop the cable through your front tire and attach to the U-Lock before you close the lock. 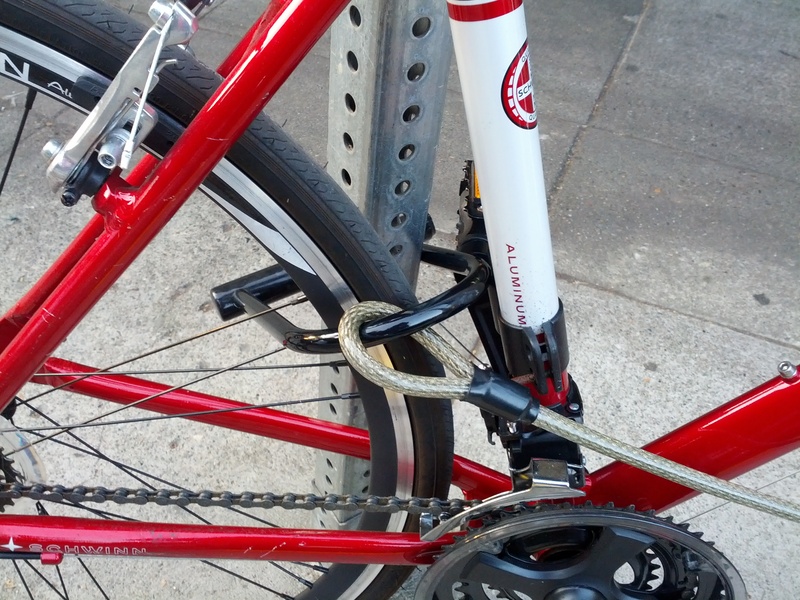 If you’re using a second U-Lock instead then use it to secure your front tire to your frame. If someone really wants to steal your bike they will. However most thieves will look for easier picking if you take these steps to properly lock your bike. And if your bike is registered, it has a much greater chancea of making its way back to you. There are easily thousands of bikes on campus. Any point during the day there are hundreds of bikes locked up at different locations from Sproul and Dwinelle to Moffitt and Barrows, just to name a few. According to the UCPD there have already been 67 bikes stolen this semester alone. That’s quite a few and doesn’t include the bike thefts that haven’t been reported. Bike robbery is a real problem in urban settings like that of UC Berkeley. 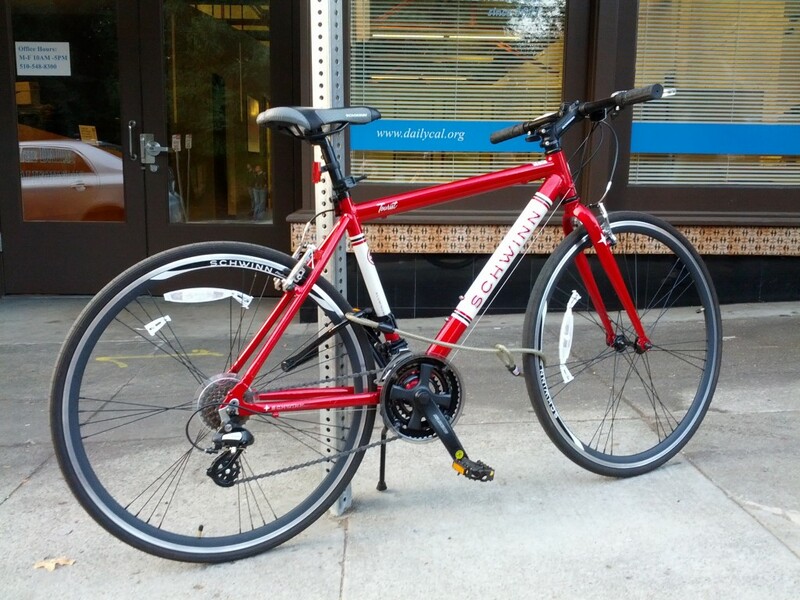 If you use a bike to get around, there is a decent chance that it will be stolen. However, there a couple steps you can take to help protect your bike. Seriously, just do it. It only takes a moment, it’s free and it will ensure your bike comes right back to you if it is recovered by the police. Only 1,100 bikes have been registered this semester so if you haven’t registered your bike yet, now is the perfect time. You can register your bike any day of the week from 6 p.m. to 9 p.m. at the UCPD front counter in the basement of Sproul Hall. You will need to bring your bike and your Cal Student ID. 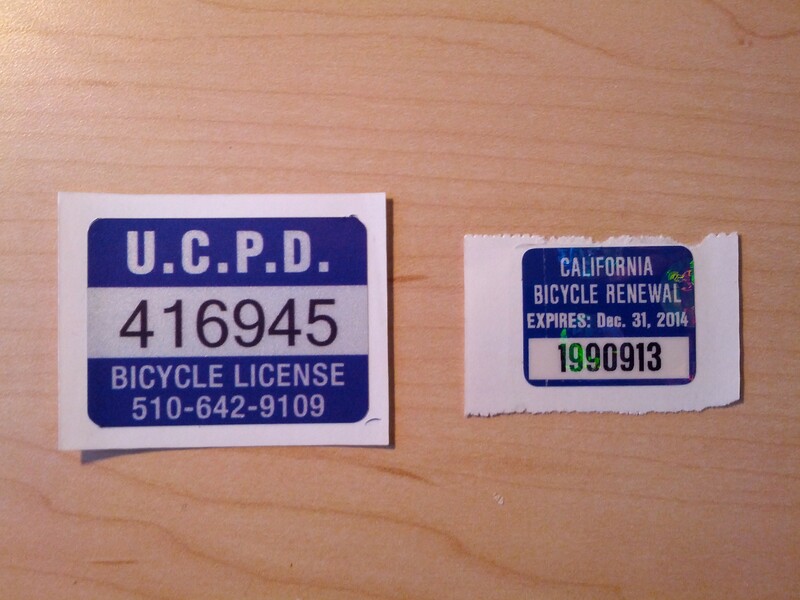 Once there, a friendly Community Service Officer will help you fill out the form to get your Bike License. The other way to protect your bike is to properly lock it. Locking just your front tire to a pole is a good way to only have a front tire when you return. A common rule of thumb is that a thief is going to go for the bike that looks easiest to steal, so every extra step you take to secure your bike is ideal. Using a U-Lock is the best, cable locks are too easy to cut. 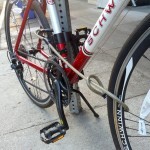 If you can, carry a cable or second U-Lock so you can secure both of your tires as well as your frame. Lock your back tire to a pole by placing it through the triangle that the back of the frame forms. This will secure the tire as well as the frame. (We’re securing the back tire with the U-Lock because it is worth more than the front tire.) 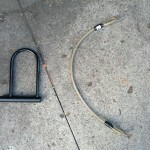 Then loop the cable through your front tire and attach to the U-Lock before you close the lock. 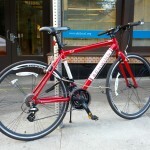 If you have a second U-Lock instead of a cable, use it to lock your front tire to your frame. Yeah, we know this sounds ridiculously complicated so check out the photo gallery below for better explanations. If someone really wants to steal your bike, they will. However most thieves will look for easier pickings if you take these steps to properly lock your bike. And if your bike is registered, it has a much greater chance of making its way back to you. For more information, check out the bike section of the UCPD website . Secure your back tire to the pole within the triangle of the frame.